Generous members of the Crawley community have raised more than £2,000 after a dog died in a reported stabbing. 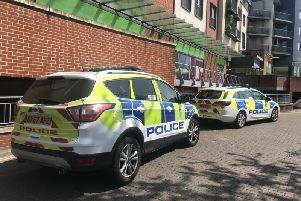 A man and dog were attacked near Hollywood Bowl in Crawley yesterday in a reported stabbing. Click here to read the original story. However the dog - believed to be named Diesel - received serious injuries and was for emergency treatment. Sadly the dog did not survive, police said. As the news broke that the dog had been injured it appears that members of the Crawley community came together to help raise money to pay it's vet bills. A JustGiving page was set up, with a target of £3,000. The page said yesterday: "We are in direct contact with the vets . "It matters not what happened today, what matters is an innocent animal was hurt and that animal needs help. "SEERS CROFT have been amazing and are doing all they can to save him." A total of £2,194 has been raised so far. However with the news that the dog did not survive, the page has issued an update. It said: "It is with a heavy heart this morning that I tell you Diesel did not make it through the night. "We have raised more than enough to.cover the vets fees and would.ask no further donations are sent. "Any extra money raised will be put towards a memorial for this innocent pup."